MIGUEL LOPEZ JR. INC., a Miami-based minority owned commercial and government asphalt and concrete maintenance solutions provider, is proud to announce their recent 8(a) Business Development program certification awarded by the U.S. Small Business Administration (SBA). 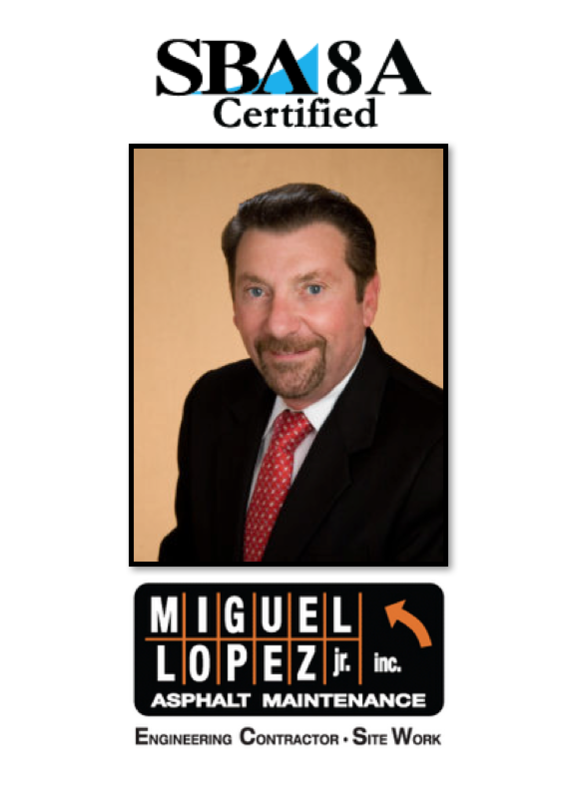 After passing the review and rigorous requirements in the 8(a) Certification process, this certification award proves that Miguel Lopez Jr. Inc. meets the requirements to do business with local, state, and federal government agencies as well as large corporations, as a small disadvantaged business. Per the SBA, this is a unique certification with a commitment to utilize 8(a) certified firms in its programs and establishes a statutory goal of 23% of Prime Contracts for small businesses. Additionally, the SBA encourages all prime contractors to use SBA 8(a) Certified firms. Municipal, State and Federal Agencies call on FDOT Disadvantaged Business Enterprise (DBE) Certified and 8(a) Certified facilities maintenance and Engineering contractor Miguel Lopez Jr. Inc. (8a Case # 308008) for their full-service asphalt project needs because of our coveted reputation for professionalism, quality and outstanding service. We are committed to using state-of-the-art products, techniques, and equipment to ensure each job is done to perfection, on time, on budget and safely.